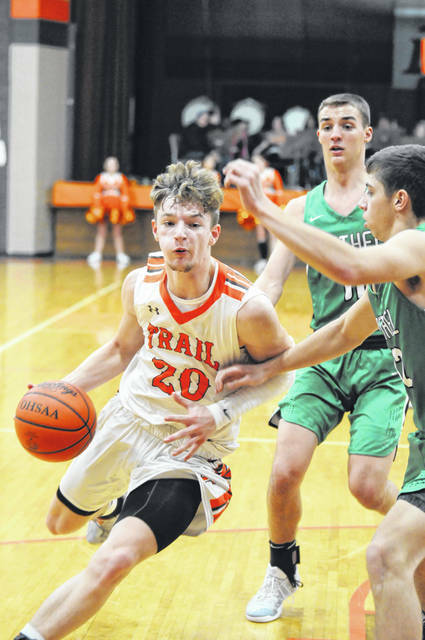 National Trail’s Hunter Michael had a double-double with 13 points and 10 rebounds to help the Blazers to a 70-29 win over Bethel on Friday, Jan. 18. Trail improved to 12-2 overall and 5-2 in the CCC with the win. 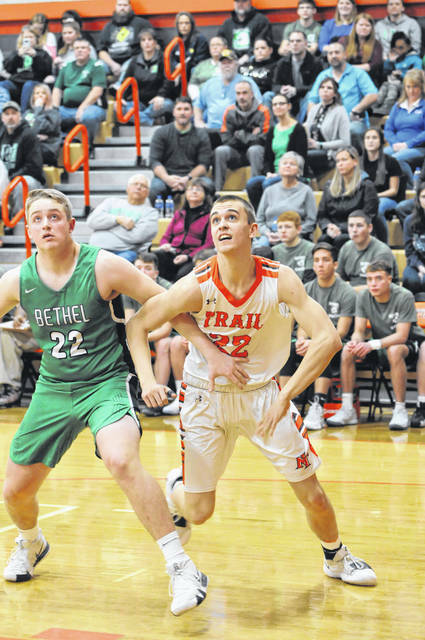 NEW PARIS — National Trail boys’ basketball coach Mike Harrison was expecting a close game with visiting Bethel on Friday, Jan. 18. 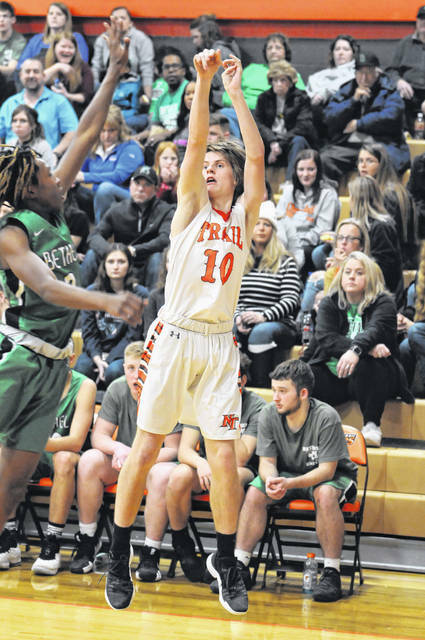 What he got — in a battle of two teams locked in a tie for second place in the Cross County Conference coming into the game — was a near perfect performance from his team and a 70-29 blowout win. Harrison called the win a “team” effort. “It was nice. We were getting contributions from everybody,” Harrison said. After falling behind 4-0, Trail closed out the first quarter on a 16-0 run with the scoring coming from four different players. Bethel opened the second quarter with a 6-0 burst, only to see Trail finish the quarter with a 9-2 run to take a 25-12 halftime lead. The Blazers ended any suspense the game would get close with a 9-0 run to begin the third. By the time the scoring run was over, Trail had built a 46-13 lead. Trail held a 48-18 lead after three. 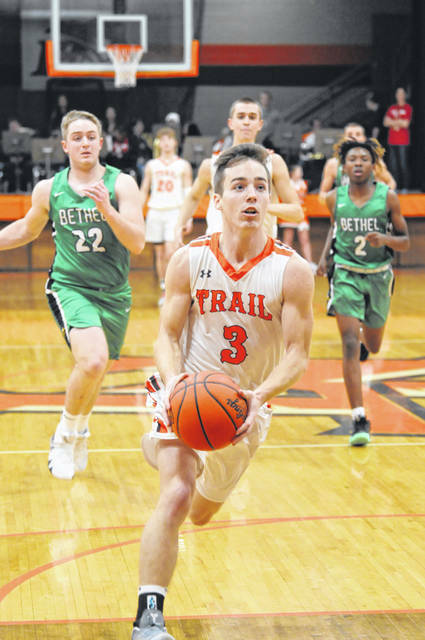 Travis Hunt, who scored 11 point in the decisive third quarter, led the Blazers with 19 points, including making five 3-pointers. He also has four steals. Zach Woodall scored 17 points, 11 in the second and third quarters combined, and grabbed 14 rebounds. Hunter Michael had a double-double with 13 point and 10 rebounds. Cameron Harrison added nine point and six assists. 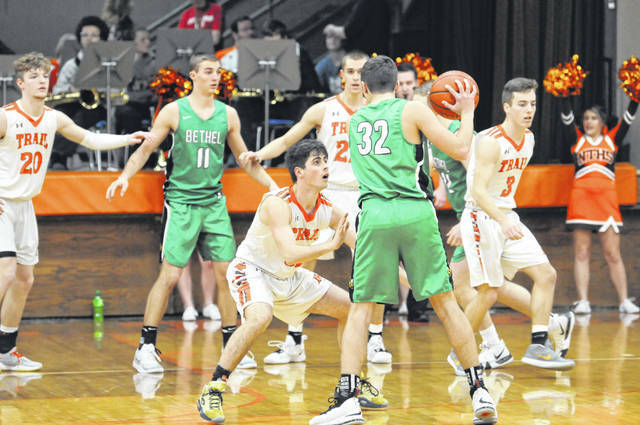 For the game, Trail out rebounded the Bees, 35-21. The Blazers limited Bethel to just two offensive rebounds in the game and one of those came on the final possession of the contest. 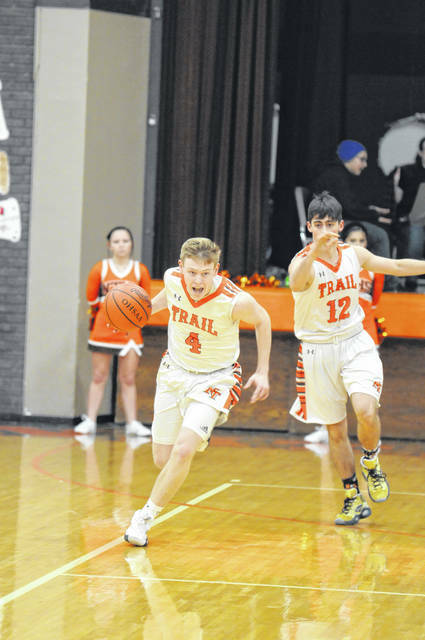 The Blazers (12-2, 5-2 CCC) were scheduled to play at Brookville on Tuesday, Jan. 22. On Friday, Trail will travel to Ansonia. 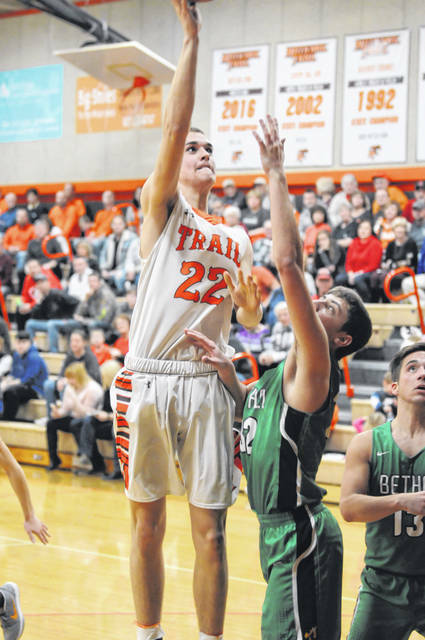 https://www.registerherald.com/wp-content/uploads/sites/41/2019/01/web1_ntbbk1-1.jpgNational Trail’s Hunter Michael had a double-double with 13 points and 10 rebounds to help the Blazers to a 70-29 win over Bethel on Friday, Jan. 18. Trail improved to 12-2 overall and 5-2 in the CCC with the win.